An inspirational man and amazing boxer. 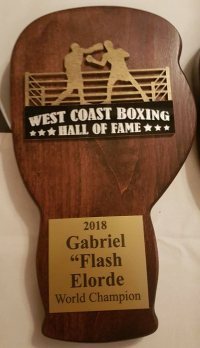 One of the truly greatest fighters in history, legendary Filipino boxer Gabriel "Flash" Elorde" has been elevated to the West Coast Hall of Fame. 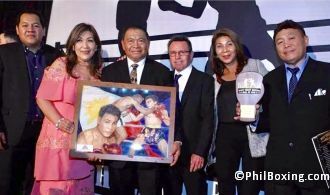 Forty-seven years after Flash Elorde's last rumble, the world continues pouring on him meaningful accolades, the latest is the induction of the thrilling champion into the United States' West Coast Boxing Hall of Fame. A southpaw, Gabriel "Flash" Elorde was known for his superb boxing skills and lighting speed in the ring. At a time when world-rank boxers were owners of superior fighting talents, Gabriel Elorde reigned as a 130-pound world king since 1960, going on to become the WBA and WBC's division champion for a total of seven years, still a record for the weight-class. Elorde thrilled boxing fans around the world while battling the most fearsome warriors on Earth, including champions like Italian-American Johnny Bizarro, dangerous Japanese Teruo Kosaka and legendary technician "El Tigre" Ismael Laguna of Panama. "This is so touching. 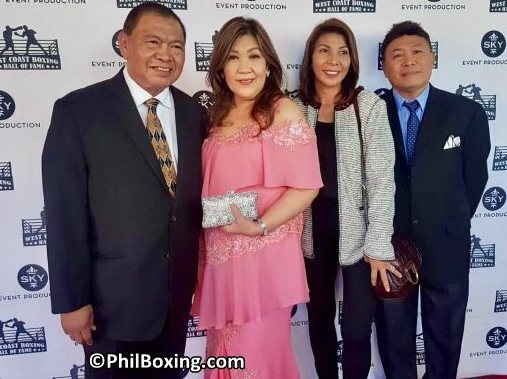 The entire Elorde Family, including our 90 year-old mother Laura Elorde feel so much honored that 33 years after our father's passing away, the world boxing community continues giving him accolades. It's beautiful. "The induction of our Daddy to the West Coast Boxing Hall of Fame is so precious to us as we continue our father's legacy of taking care of young boxers who have dreams of becoming world champions. "We want these your boxers - both boys and girls - to remember the qualities of a person that our dad exemplified. "Because Gabriel Flash Elorde was a person who feared no man in the ring, but was humble before all men. "Those video images so much applauded by the audience, though were emotional for us," shared Liza Elorde. "In addition, many persons from the world of boxing whom we met during the induction ceremony in California, had so many great words about dad's character inside and outside the ring. "This is just amazing that the boxing community still shows so high respect to our daddy." Gabriel "Flash" Elorde was born in Bogo, Cebu Province in 1935 and passed away in 1985. He climbed the ring for a total of 118 fights, winning 88 combats, losing 27, with 2 draws. Legendary Hall of Famer fighter "Hands of Stone" Roberto Duran of Panama once told Liza Elorde that he considers Filipino Gabriel "Flash" Elorde one of the greatest boxers ever, one of his idols and a man he admired. The WBC considers Gabriel "Flash" Elorde the greatest Super Featherweight World Champion in History. The author Carlos Costa is a Panama-born veteran man of boxing living permanently in the Philippines. Carlos can be reached by email: Carlos512@hotmail.com and Whatsapp: +639184538152.